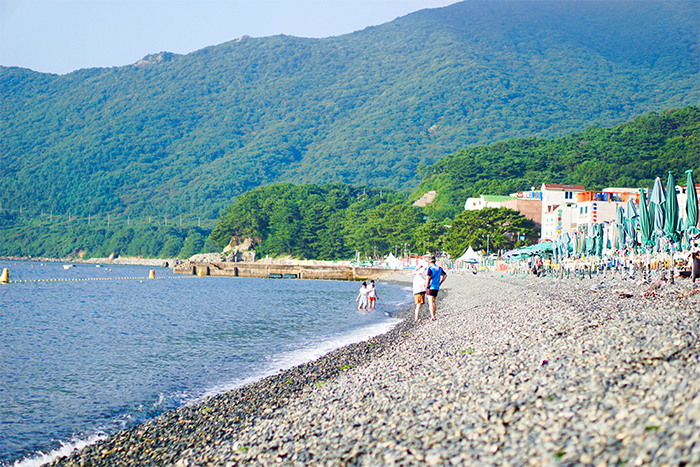 Tongyeong and Geoje are two of the most favorite cities of Gyeongsangnam-do. Not only are these cities perfect for those seeking a seaside vacation, its close vicinity to Busan makes it a great sightseeing destination to include during your travel around Korea’s south coast. Beautiful nature, on top of a variety of things to see and eat will undoubtedly make the trip as rewarding as any would expect. Particularly, there are several ideal spots for taking romantic photos with your loved ones, and thus explaining the huge presence of dating couples visiting here. 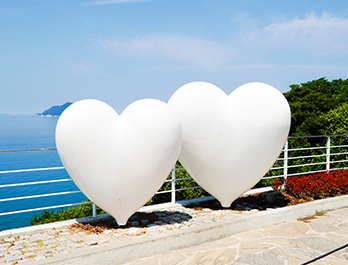 Read on to find out more how you can create unforgettable memories while on a two day romantic seaside vacation at Tongyeong and Geoje! Also often referred to as the east cliff, Dongpirang Village is well-known for its mural paintings. Tourists may get a great overview of Gangguan Port, and find mural artwork painted on every other wall here. 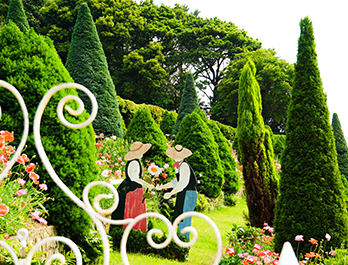 An all-time favorite date spot among couples for taking myriad of photos, visitors may also find many couples holding hand in hand, busy snapping photos along with the mural paintings. Once at the verge of being demolished, a local community decided to take lead in a revitalization project to gather people throughout the nation in order to paint murals on the walls of this village. 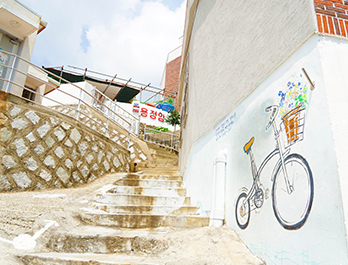 Since then, the village was transformed into a mural village, as well as a must-go attraction of Tongyeong today. Although this is a tourist attraction open to the public, there are still locals residing in village, and thus visitors are advised to take consideration of the living residents and prevent any unnecessary disturbance. Besides, there are several pretty and cozy cafes hidden in the village. 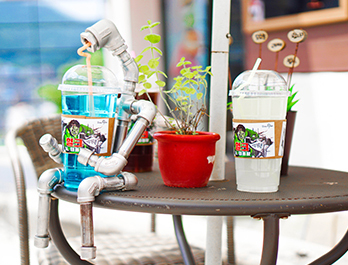 If you are tired from all that walking and exploring every nook of the alleyways, take a short rest at any of the interesting cafes that you may pass by! Directions: From Tongyeong Bus Terminal Bus Stop, take Bus No. 101 and get off at Jungang Market Bus Stop. → Walk for about 400m to Dongpirang Village. After enjoying your time at Dongpirang Village in the morning, it shall be lunch time soon after. 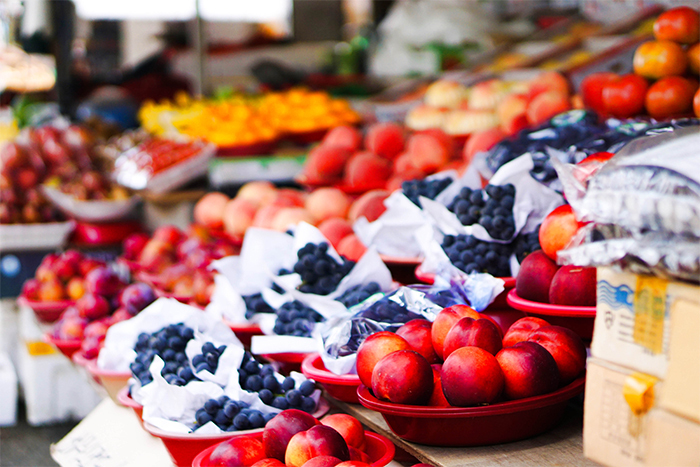 Tongyeong Jungang Market located nearby is the best place for you to experience both delicious food and a traditional local market atmosphere concurrently. 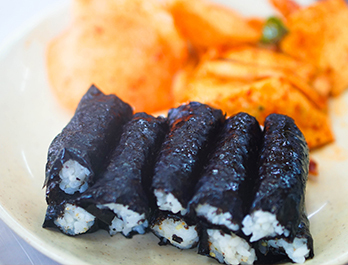 Shape of a bite size gimbap, added with a spicy seasoned squid and radish kimchi, this simple combination of ingredients makes it incredibly addictive. 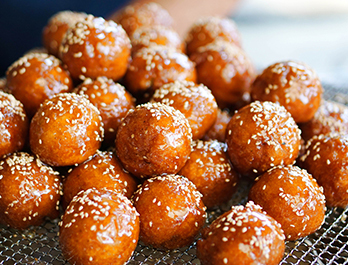 Another representative must-eat street food found in Jungang Market is the famous Tongyeong honey bread. A variety of fillings are available for options including the classic red bean, sweet potato, cream cheese, citron and more. 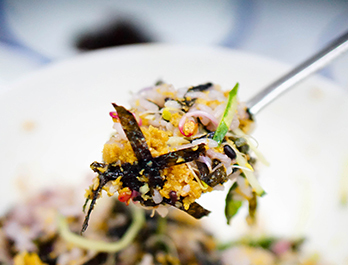 Besides these snacks, Tongyeong is also particularly popular for sea urchin bibimbap, whereby sea urchin roes are added into the mix of bibimbap bowl. Since no gochujang (red pepper paste) are added, this dish is not spicy and it gives off a rich fragrance thanks to the sea urchins and sesame oil added. 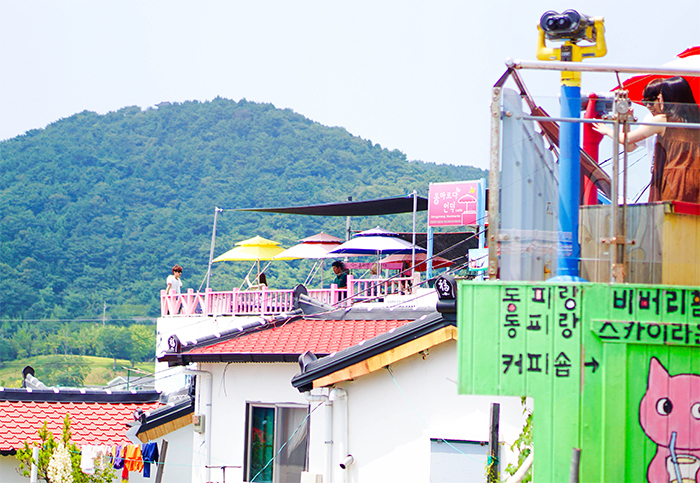 Directions: From Dongpirang Village, walk for about 300m to Tongyeong Jungang Market. The Hallyeosudo Viewing Ropeway brings visitors to the peak of Mireuksan in Tongyeong, with a distance of about 1,975m, making it the longest cable car in operation in the nation. 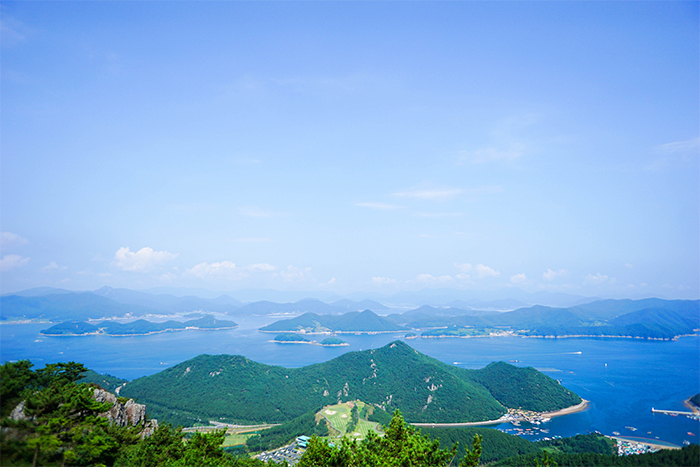 Passengers can get a panorama view of Hallyeohaesang National Park, a highlight of Namhae, from the cable car. As the cable car goes up or down Mireuksan Mountain, passengers may feel as if they are on a thrill ride at an amusement park. If you would like to enjoy picturesque vistas in all directions, walk for about 15 minutes more via the stairs to the summit, after getting off the cable car. Nonetheless, the view from the observatory when you get right out of the cable car upper station is sufficiently beautiful, a great option for those traveling with elderly. 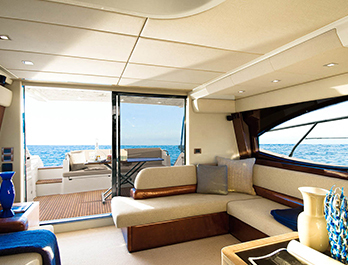 If you feel like it’s a waste to only appreciate the beautiful sea onshore, take a ride on the yacht to experience the sea atmosphere personally. For couples traveling, this could be an ideal activity to capture unforgettable memories as you ride on a posh yacht with your loved ones while out on the magnificent sea, as if some classic romance movie scene. 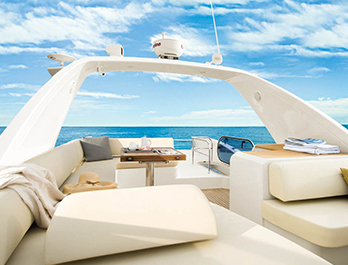 Hansan Marina Hotel & Resort provides luxurious European-style yachts. 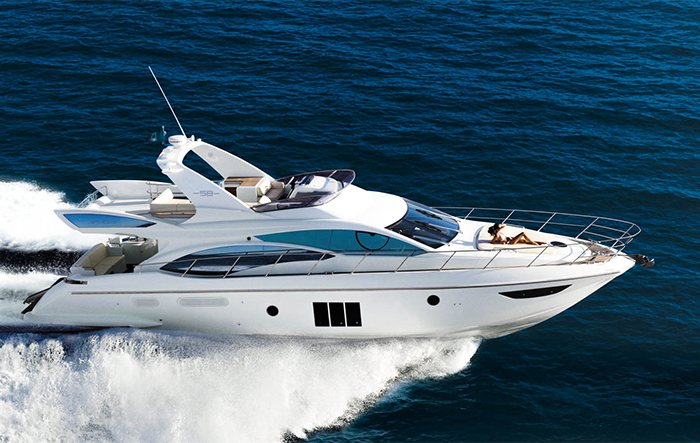 Every yacht offers drinks and other basic necessities, great for on-board parties and even swimming in the sea. If you are looking for cheaper alternatives to enjoy this yacht experience, you can gather a few friends to join the regular ’70-min’ yacht experience program. For those who prefer having privacy and a more lavish experience, renting a yacht is recommended. Accommodation is also available on yacht, making it a popular activity among couples who wish to celebrate anniversaries or hold wedding proposals. Directions: Take a taxi from Hallyeosudo Viewing Ropeway for about 4km. As public transportation within Geoje may be inconvenient, it is advisable to rent a car or take a taxi from the Geoje downtown (nearby Gohyeon Bus Terminal). Jangsado Island is famous for its beautiful camellia flowers that bloom in winter, and hydrangea flowers bloom in summer. As a marine park with natural beauty, several artisitic sculptures can be found in every other nook and corner of the park. In addition, it has an outdoor performance theater holds concerts once in awhile for visitors to enjoy. It will take approximately 2 hours to fully explore the entire island, and is usually corresponds to the ferry schedule. Upon arriving at Jangsado Island, free information maps are available in close proximity to the ferry dock. The map indicates tourist attractions in a chronological order, a great guidance to kick start your journey around the island. 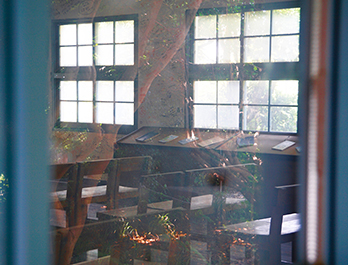 Once you bypass the central square, Jangsado Bonsai Branch School can be found. The building was formerly a school, but had been transformed into a Bonsai Garden now. For those who recall, this was the filming location of popular Korean drama “My Love from the Star (2013).” Walk further pass the Jangsado Bonsai Branch School and you can find a rainbow bridge, which was the filming location of Korean drama “Uncontrollably Fond (2016).” Besides being a popular filming location for both movies and dramas, it is also a highly sought placed among young couples who wish to spend special moments together or take wedding photo shoots. As the entrance and exit from Jangsado Island are two separate docks, all visitors must note that the dock where you first arrive is not the dock where you board to leave the island. Also, due to the presence of several ferry operators to Jangsado Island, visitors are strongly advised to remember the name of the ferry you had first boarded as you must take the same ferry back to the mainland when exiting. In order to help visitors to remember the ferry names, tickets are distributed upon boarding the ferry. Thus, you are expected to safekeep the ticket and present it to the ferry staff when boarding to exit the island. 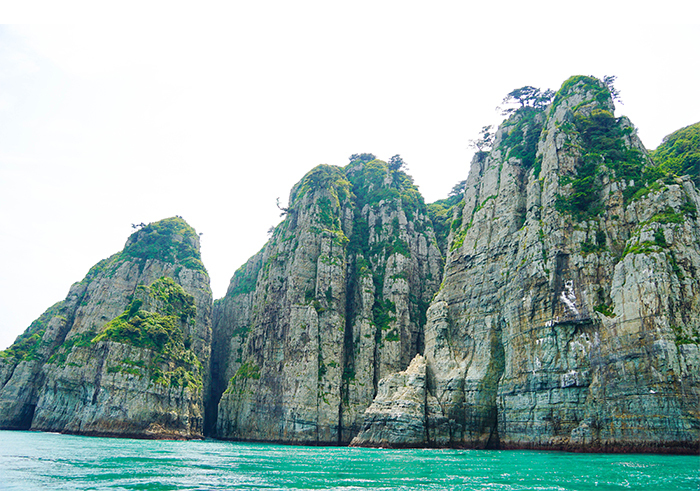 Jangsado Island is only accessible via ferries in Tongyeong province, and thus it is most convenient to board a ferry from Geoje. There are four main ferry docks namely Tongyeong Dock, Gabae Dock, Jeogu Dock and Daepo Dock. As the distance to Jangsado Island varies by docks, duration and fees differ slightly from one another. A report form has to be filled up and presented during the purchase of ferry ticket and admission ticket. According to the Korean ferry regulations, all passengers have to fill up the report form and present a form of identification such as national passport upon boarding. 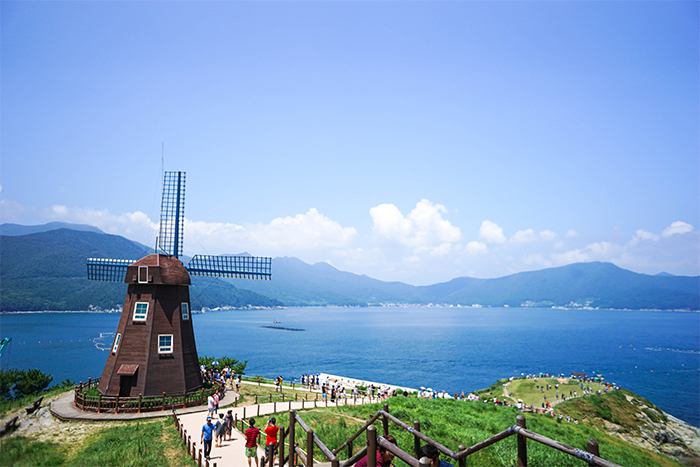 Windy Hill is a must-go place in Geoje. Situated close by the ferry dock, connecting to Oedo Island, to the right of Dojangpo Dock, the hill features breathtaking view covering green field like a painting. For that, this is well-liked attraction among couples who wish to take photos for mementos. 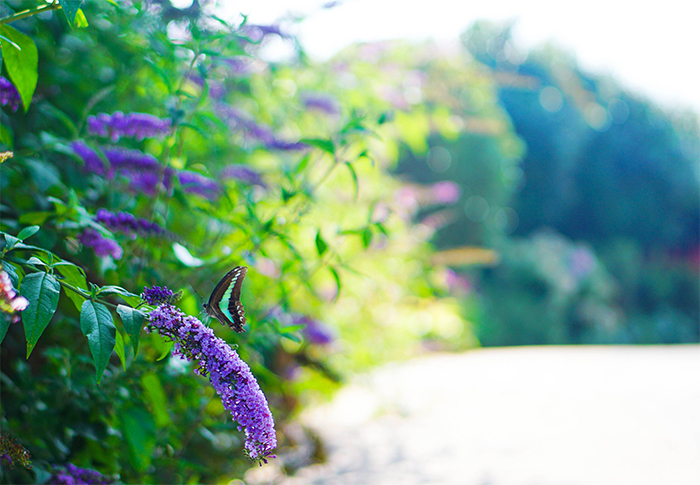 As you climb up the hill, the refreshing wind will help beat the overwhelming heat at the bay. Take a sit at one of the benches on the top of the slope, and you will be greeted by beautiful scenery of the ocean that unfolds before your sight. Directions: From Gabae, Jeogu or Daepo Port, take a taxi or rental car to Windy Hill. Oedo-Botania is a marine botanical garden, which is famous for its beautiful view of the crystal blue South Sea and surrounding landscape. The island was bought over privately in the late 1960s by a couple and is now turned into a famous tourist attraction. From the dock, follow the pathway and walk uphill while following the signs and you will be led to a paradise of greenery. 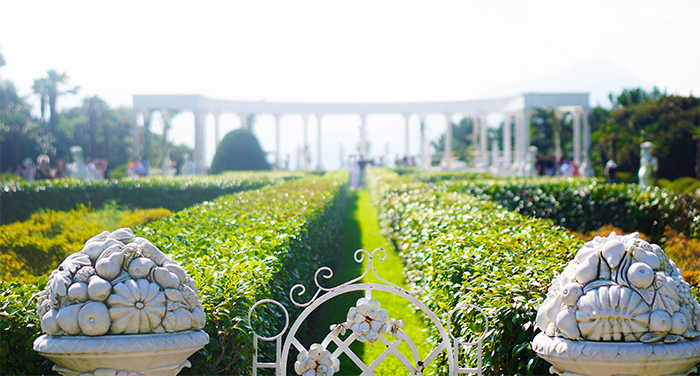 Along with a walking trail of about 1.3km, various rare plant species classified by themes, a ‘Stairway to Heaven’ that is made up of retinispora trees, and diverse heights of sculpture displays found at the Venus Garden can be seen. 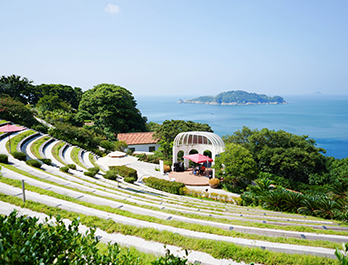 From the West of the observatory, visitors can also enjoy coffee with a view of the clear blue waters surrounding Geoje Haegeumgang Island. Undoubtedly, it also takes approximately 2 hours to fully explore this beautiful island. 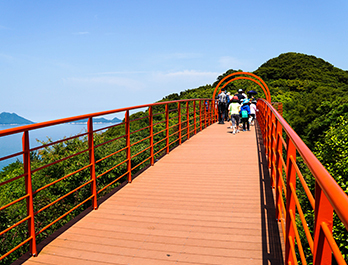 When purchasing tickets bound for Oedo, you may also apply for a tour around Haegeumgang Island. Located on the southeast side of Geoje Island, the name of the island originates from its similarity to Geumsangsan in Gangwon-do. Known as an island of rocks, it is also famous for Sipja cave, Sajabwai Rock, Chotdaebawi Rock, and other magnificent views. Especially in early dawn from early summer to fall, the fog that blankets the island creates an unusual fantastical ambiance. A total of 7 docks have ferries operating to Oedo Island. 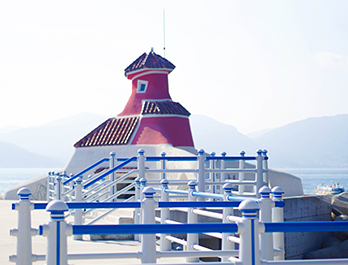 Each dock has ferry routes bound for Oedo Island, as well as an option to make a trip around Haegeumgang Island. As the distance to Jangsado Island varies by docks, duration and fees differ slightly from one another. According to the Korean ferry regulations, all passengers have to fill up the report form when purchasing ferry and admission tickets to Oedo-Botania, and present a form of identification such as national passport upon boarding. A boarding ticket is issued to help visitors to remember their ferry when boarding to exit the island. Hence, all passengers are expected to safekeep the ticket and present it to the ferry staff when boarding. 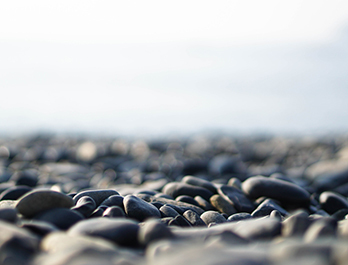 Instead of sand, Hakdong Mongdol Beach has small pebbles, also known as “Mongdol” in Korean, and it is the largest beach in the nation that is covered by these pebbles. The wild camellia forest, which blooms along the seashore around mid February, creates a beautiful landscape. The beach is also well-known for the sight of pitta (eight-color) birds that fly here. Besides, several water leisure activities, restaurants and even accommodation facilities are available in the vicinity. 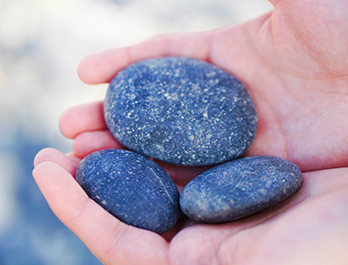 After all, the feeling one gets when walking on these pebbles is soothing and the sound of the waves are refreshing. Many food vendors, mainly seafood, can be found in the vicinity of Hakdong Mongdol Beach, and they are usually open for business from the early mornings. 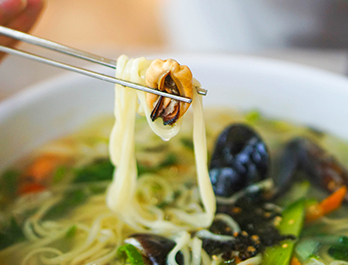 Among the seafood options, haemul kalguksu (seafood noodle soup) and chungmu kimbap are the most popular food combinations among tourists.